Earn 25,000 points after you spend $2,000 on purchases within the first 3 months. Terms apply. Introductory annual fee of $0 for the first year, then $195. 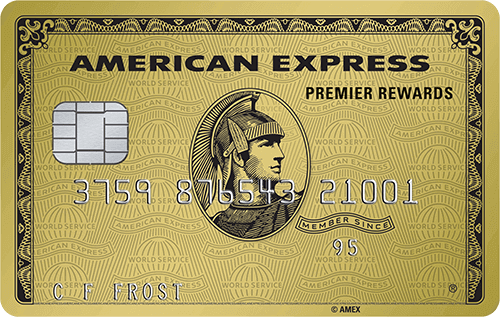 The Premier Rewards Gold Card from American Express (a SmartAsset advertiser) is a lower cost equivalent of the Platinum Card also offered by American Express. For a lower annual fee, you have access to some of the same travel rewards and a charge card with equally flexible spending limits. First and foremost, it is important to keep in mind that the Premier Rewards Gold Card from American Express is a charge card, not a credit card, meaning that you cannot carry a balance on the card. To use this card, you must pay your balance in full each month. However, as a tradeoff for this minor inflexibility and the small annual fee starting in the second year, being a Premier Rewards Gold Card from American Express member comes with several noteworthy benefits. Upon first receiving the card, cardholders can earn 25,000 Membership Rewards® points by spending $2,000 within 3 months of making an account. By booking flights through participating airlines using your card, you can earn 3 reward points per dollar spent. Similarly, you can earn 2x the reward points on purchases at participating U.S. restaurants, U.S. supermarkets, and U.S. gas stations, and 1x the points on other purchases. These points can be redeemed on travel, online shopping, entertainment, dining, gift cards, etc. or can be transferred to airline rewards programs like Delta SkyMiles® or hotel rewards programs like Hilton Honors®. However, simply by becoming a card member, you already can benefit from complimentary services and rewards. Each year, all cardholders are provided with $100 worth of credit at a participating airline of their choice that can be used on any incidental travel fee such as checked baggage or in-flight meals and entertainment. Card members can also earn up to $75 of hotel credit and room upgrades when booking stays at the Hotel Collection through American Express Travel. Furthermore, traveling internationally won’t cost you extra as there are no fees for purchases made abroad. In summation, if you are a frequent traveler and looking for access to the perks associated with American Express charge cards for a smaller cost than the Platinum Card, the Premier Rewards Gold Card from American Express might be the right card for you. $100 Airline Fee Credit. Up to $100 per calendar year for baggage fees and more at one airline. APR for Cash Advances: N/A. Annual Fee: Introductory annual fee of $0 for the first year, then $195.